Every company, employer or organization requires direct deposit forms to be able to directly transfer salary and other expenses to the accounts of their employees. Our wide range of sample direct deposit forms is ideal for this purpose. They are ready to use, easily editable, available in a variety of convenient formats and are even free of cost. The Deposit Forms make the process of direct deposits quick and easy. 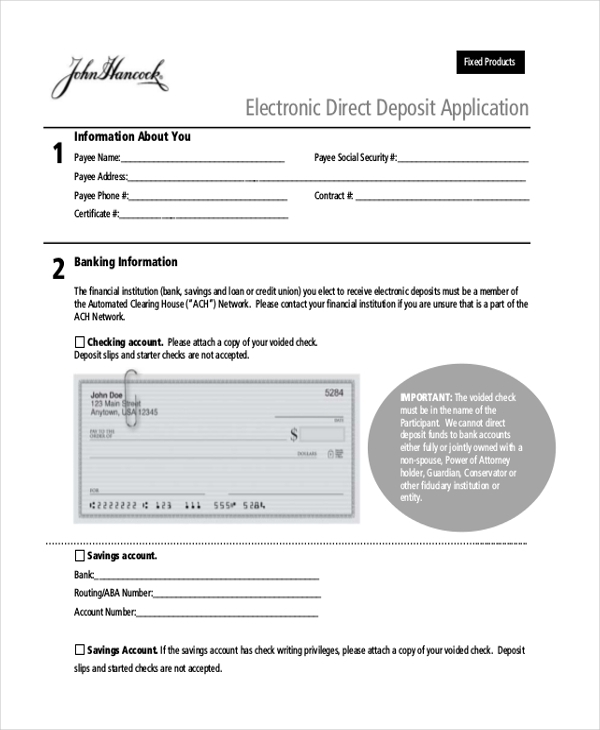 Here’s the list of our available sample direct deposit forms. 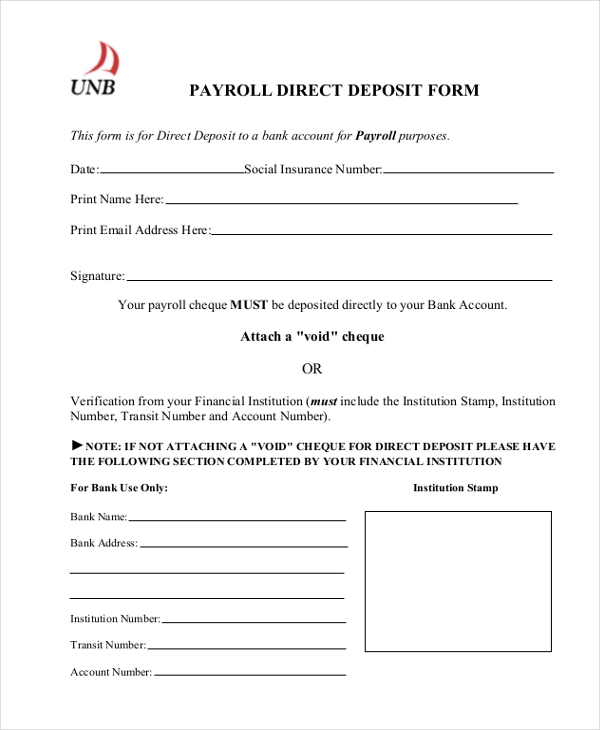 The sample payroll Direct Deposit Forms has space for the user to add the name, email address, social security number, signature and other information of the employee. Additionally, there is also space for the user to add the bank details of the transferee. This form is available in PDF format. The sample employee Direct Deposit Forms is ideal for small and medium sized organizations. This form has space for the user to add vital details of the employee, bank details of the employee and even attach a void check. This form is available in PDF format. 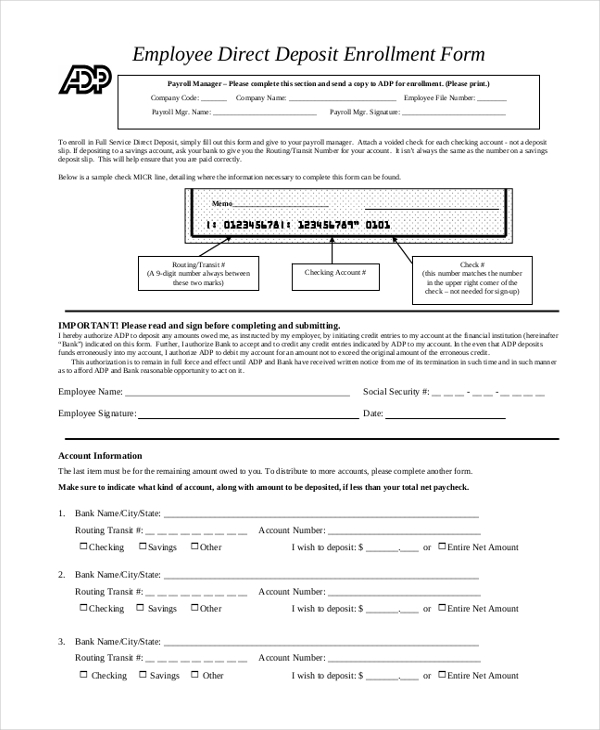 The sample direct deposit enrollment form is a professionally drafted template that can be used by any comptroller’s office. This form is available in PDF format and is also printer friendly. 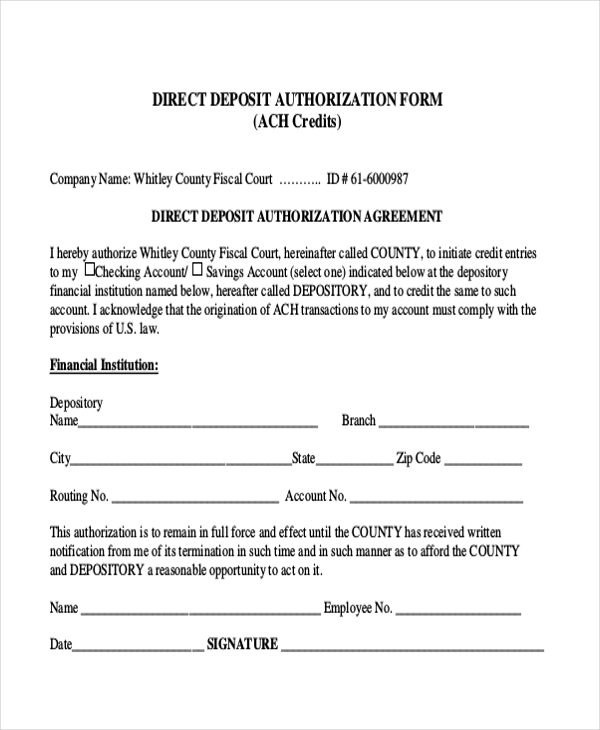 All types of organizations and companies can use the sample direct deposit agreement. This form is available in PDF format. It carries detailed deposit instructions too. The form can be emailed or is printer friendly too. 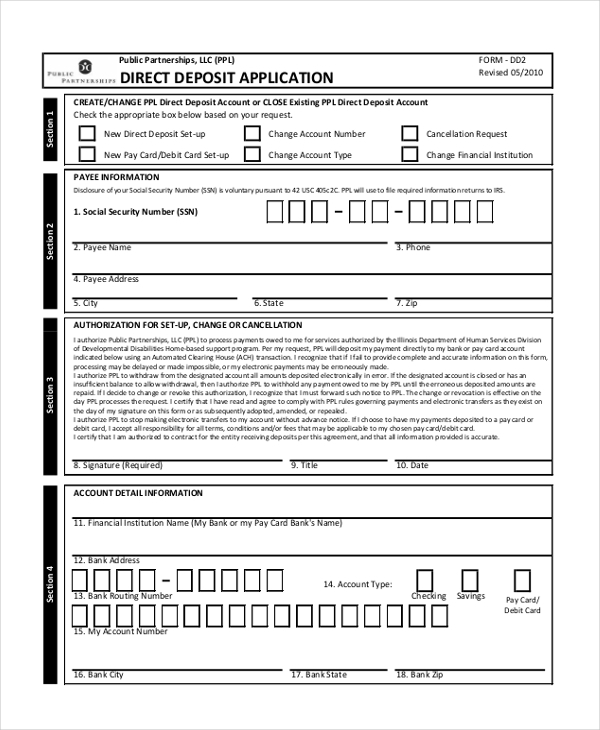 The direct deposit request form is a simple and uncomplicated template. This form is available in an easily editable format. The form is ideal for small-scale companies or organizations. The paycheck direct deposit form is another PDF format template that is simple and best suited for organizations of small sizes. This form has space for only the important details such as the personal information of the transferee and his bank account information. 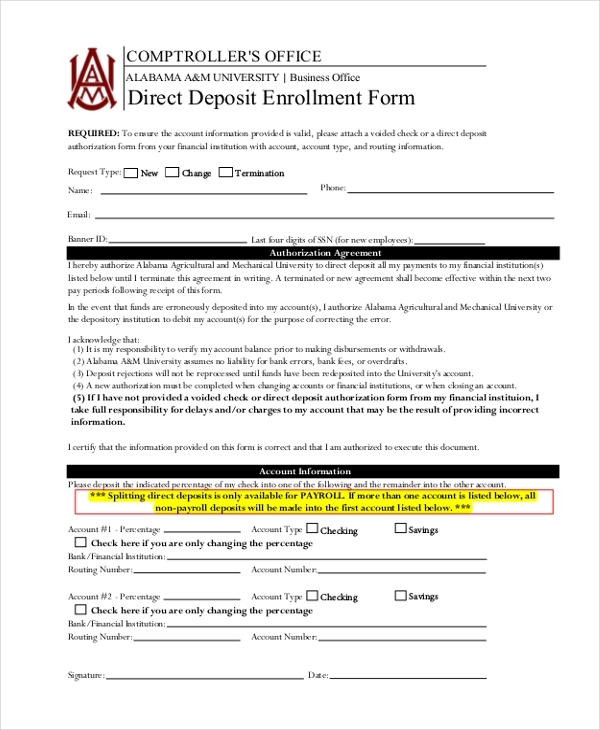 Universities and colleges use the student employment direct deposit form. It has space for the user to add his personal details, attach a copy of a void check as well as include his bank account information. This template is available in PDF format. 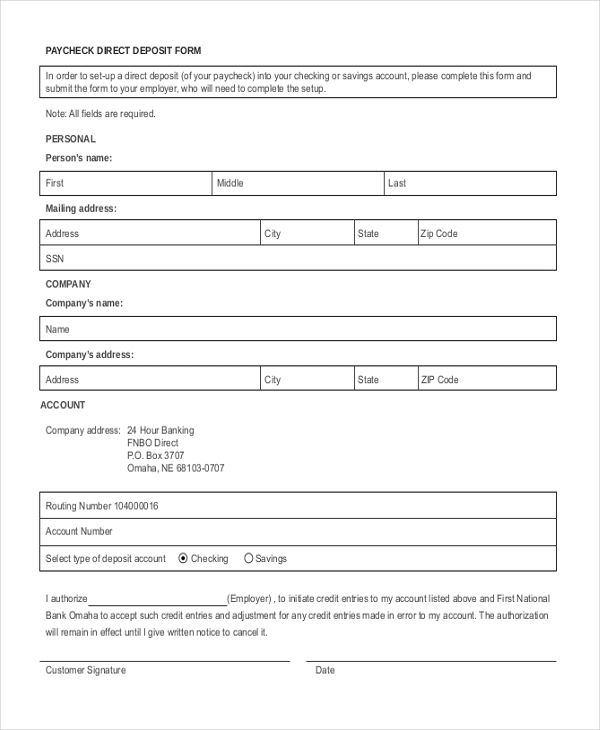 The sample direct deposit application contains instructions on how to complete the application form and it also has space for the users personal as well as bank details. This form is available in PDF format. 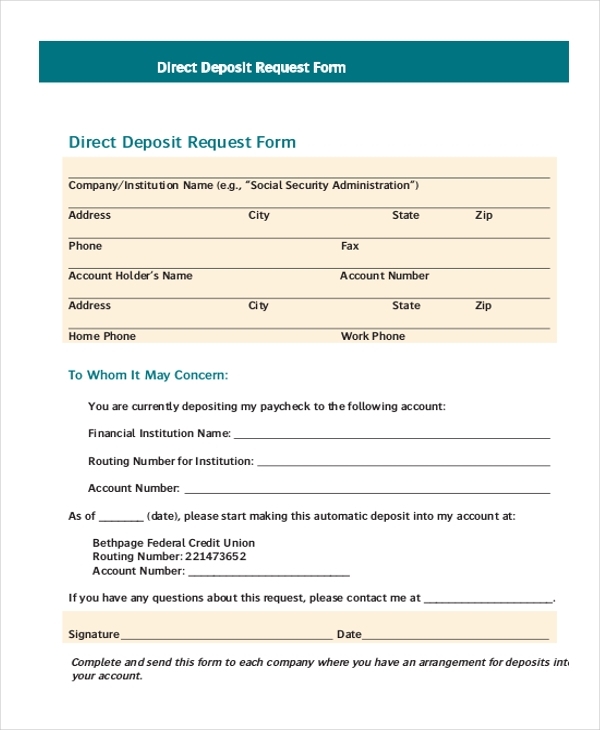 The electronic direct deposit form has space for the user to attach or tape his void check, add his personal information and also include his banking details. This form is available in PDF format. The target audience for the sample direct deposit form typically comprises of all types of companies and institutions. From corporate organizations to educational institutions, medical institutions, and various others, pretty much anyone who wishes to make direct deposits to the accounts of their employees can use these professionally drafted sample direct deposit forms. University and college students who decide to take up a job on campus can also submit their direct deposit forms to their employer for direct and hassle-free deposits to their bank accounts. Employees of both senior, as well as junior levels, can use these forms. What are The Benefits of Using the Sample Direct Deposit Form? There are several benefits of using the sample direct deposit forms. First and foremost they are absolutely free of cost and one need not spend time or money on having a sample form drawn up. Additionally, these forms are also beneficial because they help in quickening the process of deposits, making it hassle free. 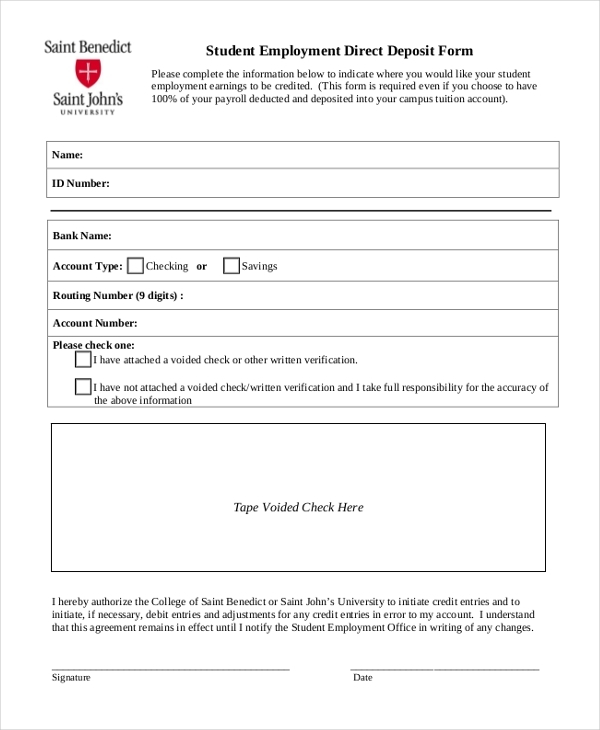 Another great benefit of these forms is that they can be used electronically as well as in the form of a hard copy, making it extremely convenient for the user. Lastly, the sample direct deposit forms are also beneficial due to their convenient and universal formats. What is The Purpose of The Sample Direct Deposit Forms? The main purpose behind the sample direct deposit forms is to make easy the transfer of salary or other employment expenses to the account of the employee. 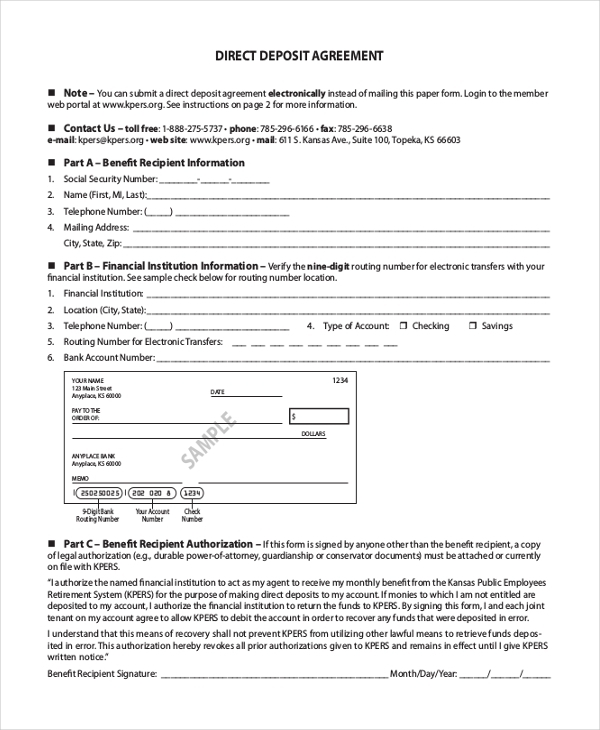 These forms give authorization to the employer to make a direct deposit in the account of the employee, thereby reducing the amount of time and effort spent in making a deposit in alternate ways. In large-scale organizations, deposits are made on a regular basis and if the employer doesn’t have the authority to make a direct deposit, it will end up wasting a lot of his time. Thus, with the help of these forms, the employer will be able to make an instant deposit and the employee will receive his payment quickly. You can also see Social Security Direct Deposit Forms. So, if you’re looking out for a professionally drafted sample direct deposit form, you need not to look any further. Select one that best suit your requirement from the above-mentioned list and start editing, printing and hand it over to your employee for filling in. These forms can be used by organizations of all sizes.